Well, as it turned out I wasn’t all that satisfied with the huck lace snowflake bookmarks. The variegation in the color made it difficult to see the pattern distinctly, and the shade of blue didn’t help either. This was ironic because I had been extremely happy with the yarn when I dyed it. It’s a nice dark blue, which is not easy to get with woad on cellulose. But it’s a bit too dark for effective lace, it seems. Not enough reflectivity, perhaps. 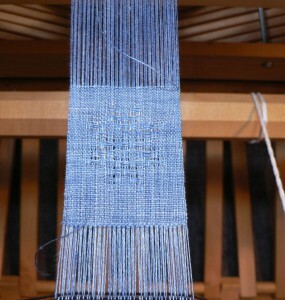 Here are a couple images of a snowflake motif in woad blue 40/2 linen. It is tricky to squeeze in weaving around teaching and my shifts at the Shelburne Arts Co-op, since weaving is a time consuming process, multi-step. I usually have to break a project into incremental tasks. That way I can do a step even if I only have a small window of time, and still feel like I am making progress. 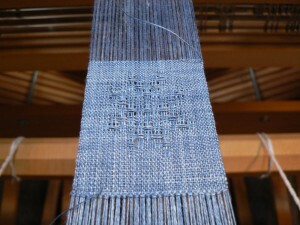 After I wove off the Hop Vine bookcloth, I planned to weave a new batch of bookmarks. For this wintery season, I planned to weave a huck lace snowflake motif, based on a project I developed for my Master Weaver Certificate. I called the original design “No Two Snowflakes Are Exactly Alike,” because the project featured 7 different snowflake motifs. To make it work with the same threading and treadling for each, I changed the tie-up between each snowflake. This was a time-consuming way to do it, and I decided it was impractical for items that I intended to sell. So, I decided to just pick one snowflake motif for this batch. I planned to use 40/2 linen naturally dyed with woad from my garden. This afternoon I wove off the rest of the Hop Vine warp. I am pretty pleased with the cloth, and have even come around to liking the three sections that I was so critical of in my last post. 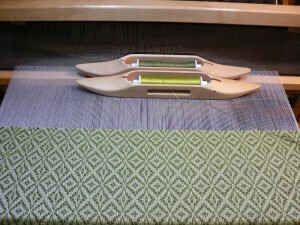 To add some variation to the pattern, I decided to switch to the “rose fashion” treadling for the remainder of the warp. You can see the difference in the two photos below. The first one shows the star fashion treadling. It is a series of diamonds with strong diagonals. 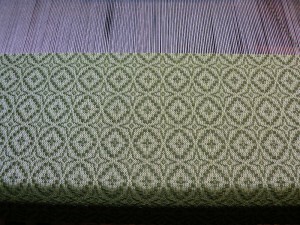 The second is the same pattern and tabby colors woven rose fashion. Four-pointed stars alternate with ovals to create more undulation. 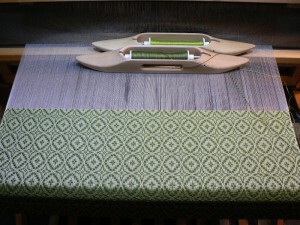 Here’s a close up of the cloth with the rose fashion treadling.